I'm Here. I'm Queer. What the Hell do I read? 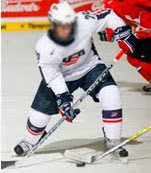 : Blogging, Honesty, and that Damn Sports Closet: Hockey Kid "Mikey"
Blogging, Honesty, and that Damn Sports Closet: Hockey Kid "Mikey"
So there was this blog that was getting a lot of attention. It was an anonymous blog, by "Mikey," a closeted gay Teen who was an ice hockey player. He talked about loving sports, and being gay, and how he felt he couldn't come out. Lots of other Teens who felt like they couldn't find a place to be both jocks and gay were drawn to the blog, and a community started to build around it. Now, there's been noise on both sides of this issue. Outrage at someone pretending to be what they're not - and at the same time, some appreciation for the fact that, written by a Teen or not, that blog created a space for actual closeted teen jocks to find each other and a sense of community. 5. It's a total catch-22 with sports and the closet - the more people say 'you can't be gay and play team sports' the more it's a self-fulfilling prophecy. We need more heroes to stand up and be out while they're still playing. (Not just coming-out-after-the-fact memoirs of retired NFL, NBA and MLB players - as great as those are.) I want to read a blog by an out and proud gay teen jock. 4. You don't have to pretend to be a Teen to create a safe space for Teens. I've worked really hard to make this blog something of a virtual Gay-Straight Alliance for Teens and their allies - and everyone knows I'm not a Teen. Adults have a really important place in the lives of Teens, but it is by being guides and creating safe spaces, not by pretending to be a Teen! 3. If you want to write fiction, write fiction. But don't try to pass fiction off as fact. Lies always get revealed eventually. 2. I'm angry for the Teens who were betrayed by someone they had accepted as one of their own. 1. I'm angry for all the gay adults who now how to fight even more that harmful myth that gay men are not to be trusted around children - because the adult that perpetrated this lie of being "Mikey" seems to have been a gay man. The myth/lie of the connection between pedophilia and homosexuality has been shown again and again to be false, but stories like this - of an untrustworthy gay adult - lying to teenagers - doesn't help that lie go away. This is a story that doesn't help our GLBTQ and Allied community. It doesn't help how our greater culture perceives us. It's also another excuse/reason for gay adults to not be there for gay Teens - because they're afraid their actions will be misconstrued as inappropriate. And that fear acts as a wedge between the generations. Ultimately, I wonder if the tale of "Mikey" and his blog will make it that much harder for other closeted gay teens to share their struggles. I'm certain it will make me more dubious of the next anonymous 'closeted gay teen' confessional. What's your take on the lessons we should learn from this? What irks me about this more than anything is that the truth would have been a great message; but this guy chose not to be truthful with readers. If you're going to blog anonymously, why not be honest? What is the point of an anonymous blog if you're lying? What image do you have to protect if it's not your own. After you talked about the gap between young gay people and older gay people, I became more aware of the missing pieces in these people’s lives. This could have been a great opportunity to breach that gap; however some guy decided that being anonymous wasn't enough, he had to lie too. I'm sad, because I know my best friend has no gay role models, and he is the most important person to me. The struggles he goes through could have been so much easier if he had a older person to talk to that had been where he is. Thanks for your blog; it means so much to so many people. Part of why I blog under my own name and with bits and pieces of my life in the mix is I just want to be me. Remembering to be someone else and what story I told to who is hard work. Role models are hard to find. And this doesn't make it any easier. I wonder though if he thought he could be of more help by being a "teen". It seems hard to get teens to relate to adults. And yet, you're doing it here. I think the trick is offering them something they want and not something we think they need.